At this page you can define what SQLyog should do if an error occurs during your import session. Abort on error. 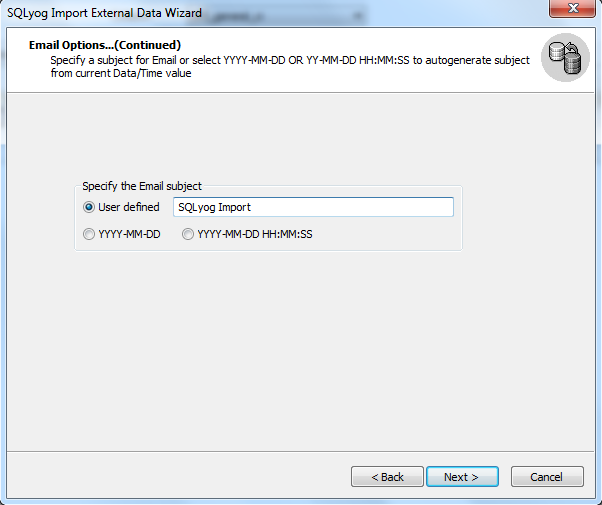 If you check this option, SQLyog will stop import in case of an error. All data already imported during the session will be kept in your MySQL DB. Email Notifications. 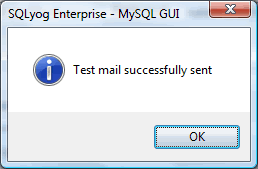 If you check this option, SQLyog will issue an e-mail message either only on error or every time this export job is executed. You should then specify the e-mail options at the next page. In the section SMTP Server Information - the parameters of your SMTP server including login and password for authentication, if required by the server. - Type the SMTP server address. You can enter the host name, including domain, or the TCP/IP address. 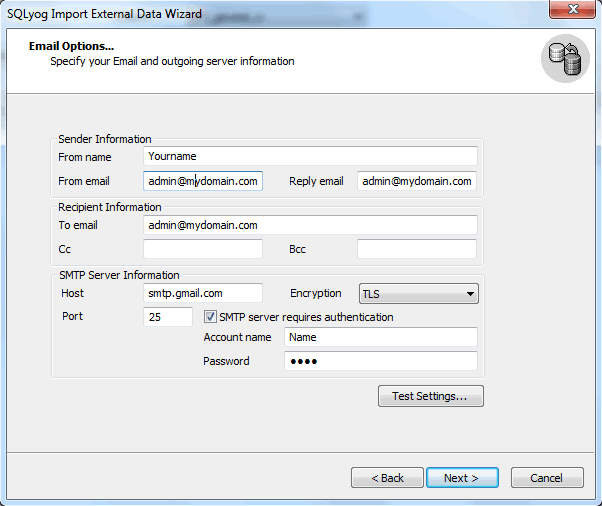 Example: Gmail SMTP address is "smtp.gmail.com". - Encryption: Select the type of Encryption - SSL/TLS mail encryption which is now supported for mail alerts. - Port: This field signifies the TCP port on which host/ip address should connect in order to deliver the message. By default, this field is set to 25 (SMTP). However, some internal SMTP servers may be setup on non-standard ports which will require that this field be changed to match the listening port of the mail exchanger. For example Gmail listens to port 465 for SSL encryption and 587 for TLS encryption. -Username and Password: When sending mail through an authenticated SMTP server, you can fill in the User and Password fields appropriately. If you are not using a secure SMTP server, an error 5xx unrecognised command may be returned from the server if you enter anything into one of these fields. Press the button Test Settings... to send a test email message using the specified parameters. 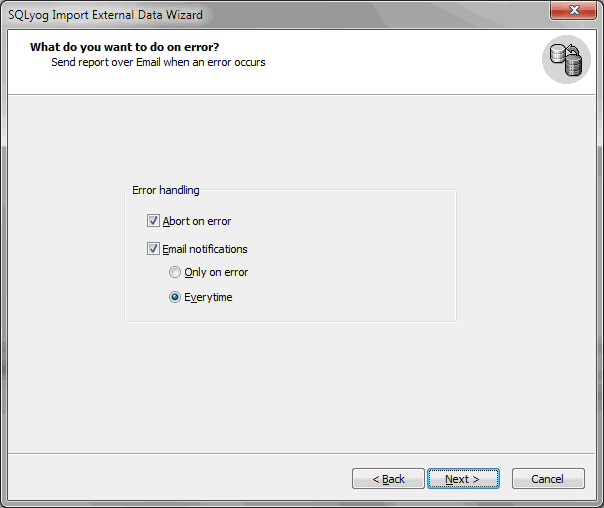 Proceed to the next Wizard page and define a subject for emails sent by Import External Data. Turn to the section Import Results Representation to look at an example of email messages reporting success or failure of an import session.